IRONWOOD BENCH PLANTER by Summerfield Terrace home decor, jewelry, decor, decorations, electronics, fountains, floor mats, art glass, vases, garden essentials, fireplace screens. 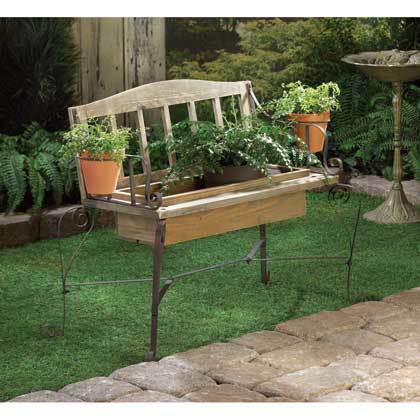 A rustic bench accented with curled metal legs that have a vintage-inspired patina makes this the best seat in the yard for your plants. Add your botanical beauties to the bench's planter box and place a potted plant on both arms for a truly delightful sight. Each ring plant holder: 4" x 4"; Inner planter space: 19" x 5" x 4" deep. Material(s): IRON WOOD - PINE Weight 8.6 pounds. Dimensions 34" x 15" x 24".